The astronomy community had been buzzing about this eclipse for many years before it actually happened. It seemed like everyone and their grandma would be trying to get into the path, so just getting to the right place and back again could be tricky. I had never been to see a total solar eclipse before, so there was a pretty steep learning curve for me. 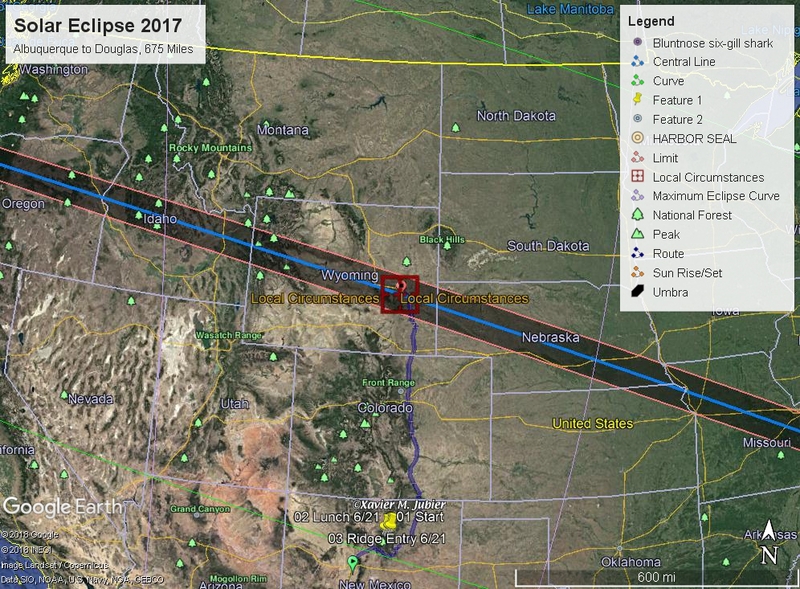 I checked some online eclipse path calculators and decided that Wyoming was probably my best bet. Figure 1: Eclipse path map, produced by Javier Jubier, with directions from Albuquerque to Douglas. It would be about a 675 mile drive in each direction, and my mom wanted to come along. 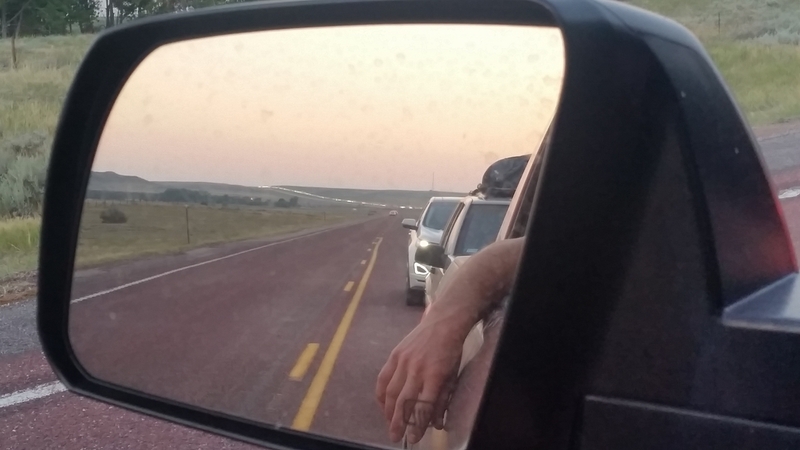 My brother, who lives halfway between me and the eclipse path in Boulder, also wanted to go, so I planned to meet him and his girlfriend two nights before the eclipse at his house and drive them up the rest of the way, then crash at his place the following evening on the way back home. The next step would be to figure out lodging for the evening prior to the eclipse. Unfortunately, hotel prices and rentals in the path of totality were outrageously expensive! I’ve stayed in Casper, WY before for less than $70 a night, but for the few days before and after the eclipse, you couldn’t find a room at the Motel 6 for less than $700! So I decided to try a different tack and connected with a local ranch owner who was willing to let us camp out on his property for $150. It was still really expensive for dispersed camping, but far more palatable to me than the alternative. It also allowed us to be within 500 feet of the center line of the path, so it turned out to be one of the best places available. With our trip itinerary ironed out, it was now time to plan the imaging session. I knew that I wanted to try to capture as many parts of the eclipse as possible, from the wispy bits of the corona, to solar prominences, to the “diamond ring” effect and Baily’s Beads. I’d get a total of 2 minutes and 27 seconds of totality, and there would be no do-overs. What can you do in less than 150 seconds? Well, it turns out, quite a bit, if you can automate your setup. Figure 2: Shot capture plan. To automate the shooting process, I ended up using a program called Astro Photography Tool. 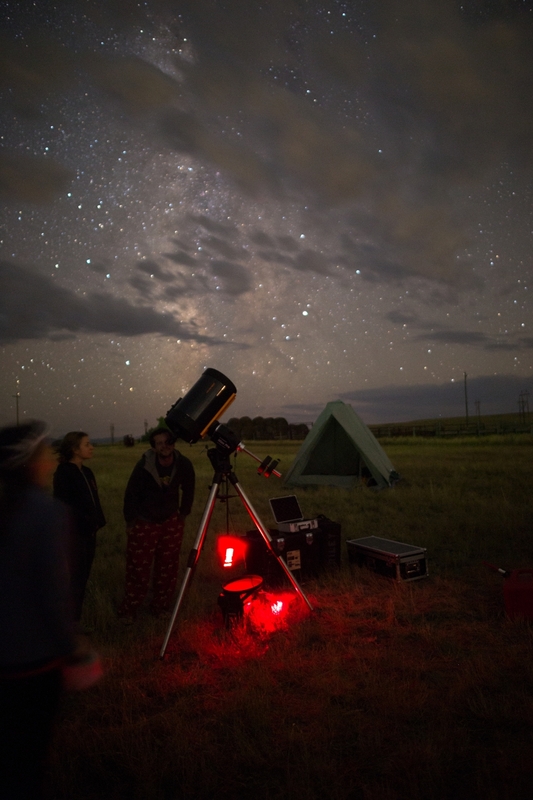 APT allows you to use a laptop to handle complex astrophotography shot sequences, including the ability to change ISO and Aperture automatically via USB cable. It will let you start sequences at specific times, but it won’t let you plan each shot to occur at a specific time, so some testing was required to make sure that the camera would reliably shoot what I wanted at exactly the right time. I rehearsed the timing of the entire shot sequence several times in my backyard. Figure 3: Running a shot sequence test. Off camera, a 65lb, 90Ah marine battery is used to power the telescope mount and laptop. In addition to the totality shot sequence, I created two more sequences for the partial phases before and after totality. 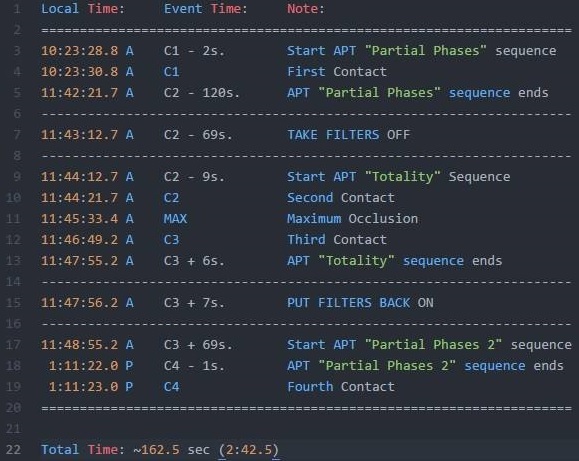 I also made plans to connect to the internet “in the field” on eclipse day to sync up my laptop’s internal clock with an internet time server to make sure that it actually started the shot sequence at the precise second I needed it to. Feeling reasonably confident that my shot plans would work, I started planning the logistics of the trip itself. I packed two tents, a canopy, some camp chairs, food, toiletries, and everything else I thought would be necessary for the camp-out itself. I’d also heard rumors that gas would be extremely hard to come by on the return trip due to hundreds of thousands of travelers all trying to get home at the same time. 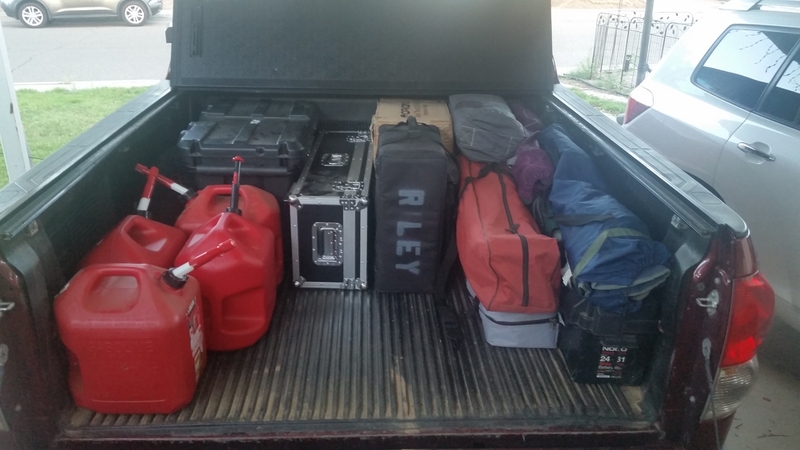 So I bought four 5-gallon gas cans and filled them for the trip (more on this in a bit). Figure 4: My truck, prior to picking up my brother and his girlfriend (and all of their stuff too). Sunday, August 19th came, so I loaded everything up and headed out of town. It was a ridiculous amount of gear. I couldn’t help but wonder if everything would work out, but all you can do is try, so I picked up my mom, made the trip up to Boulder and met up with my brother and his girlfriend. We had a great evening, then went to bed early in order to leave before sunrise. I was admittedly paranoid about the traffic heading up there, when I should have been more paranoid about the traffic coming back, but I digress. We made it to our camp site at around 9:30AM Monday morning, the day before the eclipse. So what kind of a camp site does $150 buy? One like this. Figure 5: Camp set up the night before. I slept in the hammock under the canopy while my mom took the back of the truck and my brother slept in a tent off to the right (not shown). We were the only people for miles around, perched up on top of a mesa overlooking the ranch-owners’ 7000 acres. We had an incredible view, completely unobstructed. It was perfect. Here’s how things looked in the direction of where the solar eclipse would be the next morning. Figure 6: View to the southeast. Totality would happen near the top of the frame, about one third from the right. We were about 150 feet above the valley floor. Most of Monday was spent just relaxing around camp, playing board games and eating good food. As the hours passed by, our rancher friend’s family started setting up camp about 1.5 miles into the valley to our left (you can see some of their vehicles in the photo above). We didn’t get to meet any of them, but they hilariously brought along a DJ. After dark, we could hear them singing and playing “Total Eclipse of the Heart” after they shared a few drinks with each other. The rancher came down and expressed his disdain for his “kid sister who can’t seem to give anyone a moment’s peace.” We all shared a good laugh and told him not to worry about it and that we were more than okay with them having a little fun. 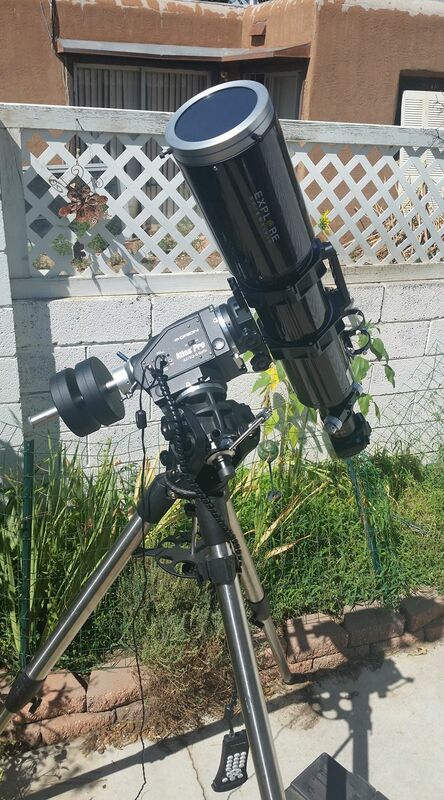 Before we went to bed, I set up my “big scope” for some star gazing. There were a few clouds out, but not too many to look at some globular clusters and nebulae. Figure 7: My brother having a look at M13 the night before the eclipse. After our observing session, I took the big scope off of the mount, put the refractor back, on and got it re-aligned again before hitting the sack. I slept pretty hard in that hammock underneath the canopy until about 3:45AM when the wind really started picking up. Due to some breezes blowing through the previous afternoon, we anchored down all four legs of the canopy I was sleeping under with the full 5-gallon gas cans, but they weren’t doing the trick anymore. What made things worse was the wind was blowing the canopy in the direction of the telescope, threatening to utterly ruin any hopes of shooting the eclipse. So I stayed up for the next hour and anchored the canopy down myself. Eventually, the wind died down again and I got back to sleep at about 5AM. Next thing I knew, it was 730AM and everyone was getting ready for breakfast, then began the waiting game until the show got underway at 10:23AM. At that time, I started the first partial phases shot sequence, then spent the next hour taking turns with my family observing the moon creep across the solar disk using an oversize solar filter. Getting from that point to totality would take more than an hour, which left a lot of time to take mental note of the things going on around us as the sky grew darker and darker. For the first half hour between Contact 1 (when the partial eclipse gets underway) and Contact 2 (first moment of totality), you really couldn’t tell that things were getting darker, other than a general dimming feeling. After that point, things started to get interesting. The temperature started to drop fairly quickly (we measured a 15 degree difference between the beginning of the partial phases and the middle of totality!). Even the bugs were doing weird things. Gnats came out about 15 minutes before totality (I assume because they thought it was getting to be night time), then went away about 7 minutes before totality when it really started getting dark. Three minutes before totality, most of the sky started taking on a reddish tone, almost like sunset. 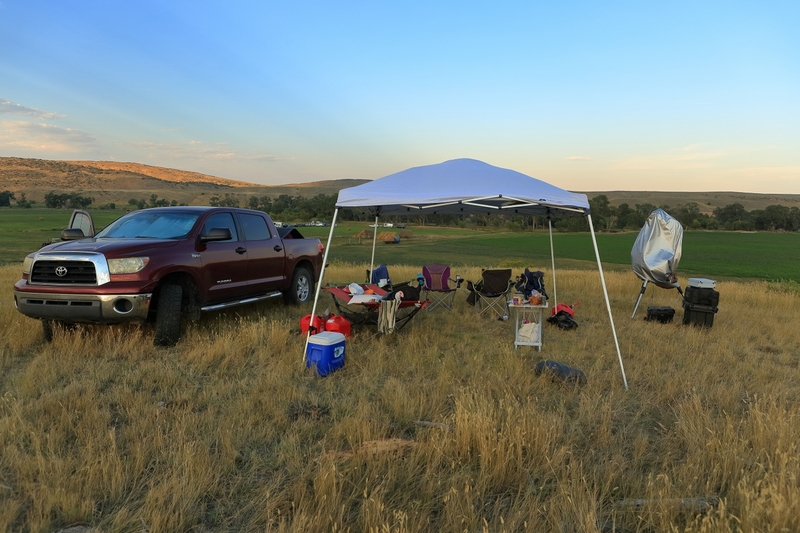 At this point, it was time for me to switch APT over to the Totality Phase shot plan, so I did and got ready for the main event. As weird as it was to see the sky darken, nothing was as striking as when totality actually happened. Almost instantaneously, the sky darkened to twilight levels; dark enough to see stars and planets with the naked eye, but with an appearance like sunset 360 degrees around us. Simultaneously, the sun’s corona appeared as a forked streak of light, emanating several solar radii away from the main disk, which was now completely blotted out by the moon. You could see the surface of the moon as if it were full, illuminated by sunlight reflected by the earth. It was totally surreal. It was at this point that I realized that my camera wasn’t shooting any more. At all. I ran back over to the laptop and realized I made a really dumb mistake. When I started what I thought was the Totality Phase Shot Plan, I had accidentally started the second Partial Phases shot plan, meaning it had only take one shot of the diamond ring, and then began waiting another 80 seconds for the next exposure. I knew that if I could get the right plan started again, I would only lose the “rampdown” phase of my shot sequence and at least get all of the exposure levels I wanted of the corona, so I ran back to the laptop and fired it up again. Thankfully, it worked, but because of my mistake, the only shot I got of the transition phases immediately before totality was of Baily’s Beads. 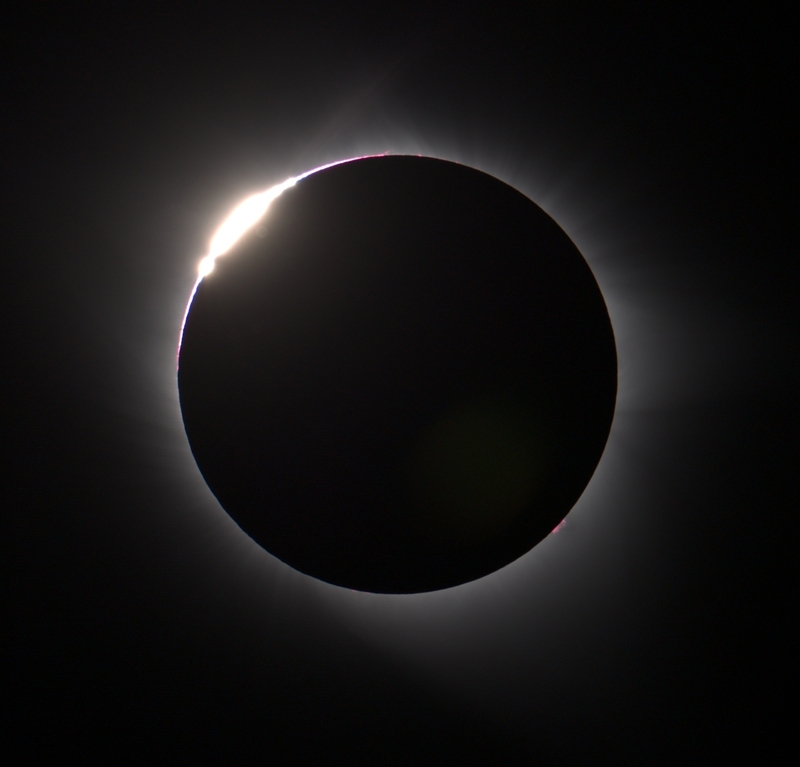 Figure 8: Baily’s Beads, in the last few seconds before the beginning of totality. Luckily, because I had planned to have two of every set of exposure settings, I still got one of each, making it possible to create this HDR image of the corona. 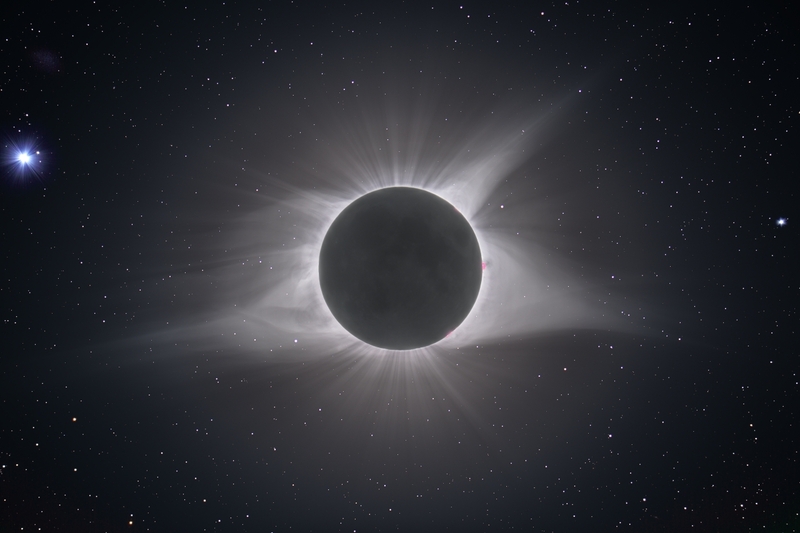 Figure 9: HDR Composite of 14 shots showing the corona extending several solar radii away from the surface of the sun. I would reshoot the same region of space several months later to add more detail to the stars that were around the sun (click here to see it in the gallery). After finishing the totality sequence, I fired up the second partial phases shot sequence and waiting another 80 minutes for it to complete at the end of the eclipse. Below is a composite I made of the entire eclipse. Figure 10: Full eclipse sequence, spanning over 2 hours of time. Sunspots are visible in the partial phases, while prominences are visible in the totality phase. Some pretty funny things happened as we were coming out of totality. The gnats made a second appearance between 7 and 15 minutes after totality, probably thinking it was morning and time for them to wake up again. I also tried to post some early eclipse photos to my Facebook and Instagram accounts, to no avail. I assume that too many people were trying to do the same thing on the one cell phone tower we had access to for miles, and the poor thing just couldn’t keep up with the demand. The Solar Eclipse legitimately broke the internet. Once the trailing partial phases were over, we packed everything up and began making our way back to Boulder at about 3PM. I decided to pre-emptively refill my gas tank with the 20 gallons I brought in at this time. Normally, the drive from Douglas to Boulder would take about 2.5 hours. But this was no normal trip from Douglas to Boulder. Not by a long shot. We had about 10 miles of two-lane highway to drive up before we got back to I-25 in Douglas. Those were the quickest 10 miles of the trip. Once in Douglas (which only has two exits), we could see traffic backing up on the freeway. It took us an hour to get from the first exit to the second. I’m certain Douglas had never seen traffic that bad in its entire history. We would later find out that between Casper to the northwest, Douglas itself, and Glendo to the southeast, 650,000 people had visited. Those three towns have a combined population of about 67,000, so nearly ten times as many people were there as usual. Figure 11: Traffic starts to back up in Douglas, WY. 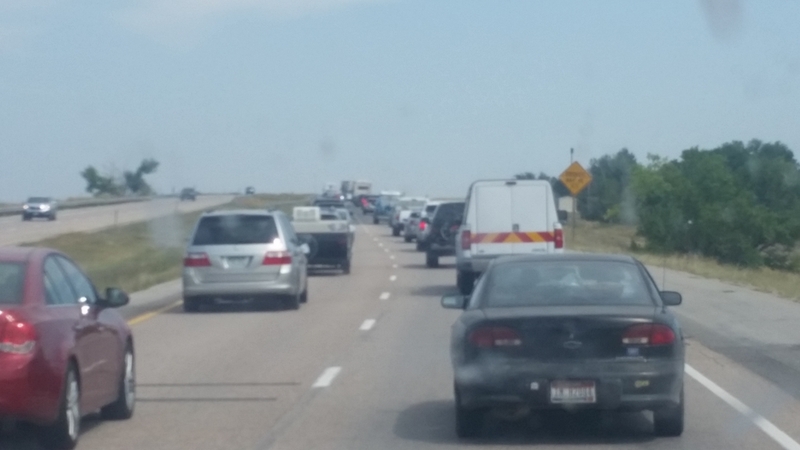 We got off of I-25 as soon as we hit that second Douglas exit and tried to take the frontage road to Glendo. We got about halfway there when traffic reached a standstill in both directions. Thankfully, we were stopped right next to a public open space on the Platte River. Some dirt roads led us right to the river bank with a view of the frontage road, so we set up our hammocks and took a nap. The traffic on the frontage road didn’t move a bit until sunset four hours later. When it started moving again, we packed our things and got back on the road. Figure 12: Chilling out by the Platte River, waiting for traffic to die down behind us. The frontage road was utter chaos. Locals on ATVs were selling bottled water, vehicle to vehicle, five dollars each, and they were selling out quickly. Bumper-to-bumper traffic stretched as far as you could see. Figure 13: Headlights stretch for miles in the rear-view mirrors. Taillights went on just as far in front of us. I think it was around 10PM by the time we got back to I-25 in Glendo. Now, if you’ve never been to Glendo before, it has a population of ~200 and a single gas station. Glendo is also home to Glendo State Park, where it’s estimated 200,000 people showed up. When we passed that gas station, there were literally thousands of cars lined up to get gas, but I’m fairly certain the tanks were empty, as no one was pumping, and people were starting to pitch tents right there on the side of the road. I was really glad to have brought that extra gas! Back on I-25, traffic was crawling at 10 MPH, all the way to Cheyenne. It took two hours to get there, and the weirdest thing happened on that part of the trip. Mayflies were swarming everywhere. I mean, they were piling up half an inch thick on the roads. It almost looked like snow. I don’t know if the eclipse had anything to do with it, but it was incredibly bizarre. Unfortunately I didn’t get any pictures of the mayflies because I was just trying to stay awake, but picture millions of mayflies, windshield wipers humming away just to keep them off, with thousands of taillights stretching over the hills as far as you could see. It was truly apocalyptic. Once we got to Cheyenne at around midnight, the mayflies were done and traffic picked up to a speedy 25-35MPH for the rest of the way to Boulder. We rolled in at about 3AM. My poor brother had to get up at 6AM for work that day, and my mom and I had another day of driving to get back to Albuquerque, but it was totally worth it, even the traffic. We still talk about that trip today, and I’m pretty sure we’ll never experience anything quite like it again. I’m glad that at least some of the pictures I planned turned out, but honestly, even just seeing it would have been enough to make the trip worthwhile. In a weird way, it was a life-changing experience, one I’ll never forget. There’s another one coming to the USA in 2024. Anyone planning on going? If so, or if you have any of your own experiences to share from the 2017 eclipse, let me know in the comments below!